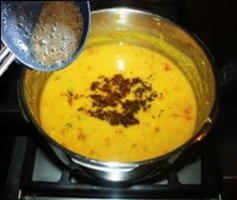 P﻿﻿﻿anchratan Dal is a unique North Indian dish. It is exotic mixture of five different lentils cooked together and flavored with spices and onion, garlic, tomato and green chili tadka and garnish with chopped coriander leaves. In Hindi Panchratan literally means five jewels which refer to five different lentils in the preparation of Dal. 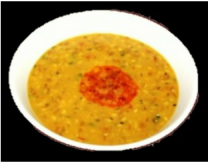 They are Toor dal (Arhar dal), Chana dal, Red Malka masoor dal, Moong dal and Urad dal. Panchratan dal is a very simple dish that is cooked in almost every Indian household. It is usually served with roti and rice accompanied with some vegetable dish. 1. In a pressure cooker add all the Dals and wash, changing water several times until the water appears clear and then soak dals in 4 cups of water for 30 minutes or longer. 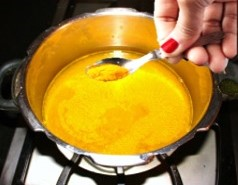 Turmeric powder, salt and 1 teaspoon of oil and mix. When Dal is boiling it creates lot of foam and the foam comes out from pressure cooker to prevent that it is a good idea to add little oil. 4. In about 8 to 10 minutes pressure cooker will start steaming turn the heat down and cook for 7 to 8 minutes. Turn the stove off and wait until steam goes down. Different brand of cooker require different time to cook. 6. 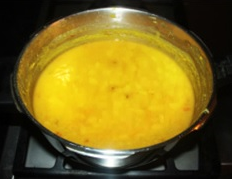 Open the pressure cooker and turn the stove on to medium heat, with the cooking spoon mix dal well so there are no lumps, if the dal is thick then add more water if it is too watery, then cook little longer. 7. Add Onion, tomato tadka and mix and cook for 5 minutes. 8. Add cumin seed Tadka and cook for 1 minute and turn the stove of or until you have the desired consistency. 1. If you wish you can skip onion tadka or any other tadka and alter Dal to your taste. 1. Heat oil in a small pan (tadka spoon) add 1 tablespoon oil, cumin seeds and, asafetida, fry them for 2 to 3 minutes or until cumin seeds become dark brown Turn the stove off. 1. Heat small frying pan, add 1 tablespoon vegetable oil, chopped onions and minced garlic and sauté them on medium high heat for 5 to 6 minutes or until onions become light brown, while frequently stirring them. 2. Add chopped tomatoes and chopped green chilies and cook. With the spatula try to mash the tomatoes so that they become soft quickly. In about 5 to 6 minutes tomatoes will become soft and blend with onions. Turn the stove off.